Perhaps it was the jet lag but at 3:00 AM, Al was up and out experimenting with night photography. Or it could have been the mosquitoes. Live on a canal in warm weather, leave the windows open at night, and a mosquito will find you. We purchased some repellant, put it on ourselves, set the tube on the nightstand with the cap off, and were never bothered again. Before leaving home, we had reserved tickets for a performance of Puccini's Tosca. 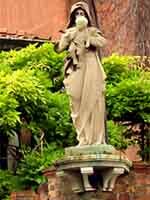 Since La Fenice, the grand opera house of Venice, was destroyed by fire in 1996, operas have been performed in various venues around the city. Tosca was to be performed in a huge tent on the island of Tronchetto. The only means of getting there was by vaporetto, so we decided to scout the location to get an idea how long it would take to get there. The vaporetto (motorboat bus) is a great bargain in an expensive city. A seven-day pass, costing 30 euros, permits you to use a vaporetto at any time for a week. This allows great flexibility in moving about the town. Without the pass, one has to consider the pros and cons of walking a long distance or paying for a one-way or round-trip ticket. Once we bought our seven-day pass, we never had to think about anything except our own whims as we moved about the city. After checking out the logistics for the evening's trip to Tronchetto, we intended to head out to the islands of Murano and Burano. 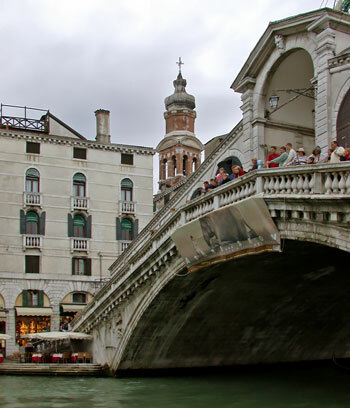 Unfortunately, I got us onto the wrong vaporetto and we ended up at the Rialto Bridge. Just as well, though, because it soon began to sprinkle. We occupied our time by purchasing tickets for three more musical events that interested us. When it began to rain, we ducked into Pizzeria al Burchiello on the Campo Santa Maria Formosa. 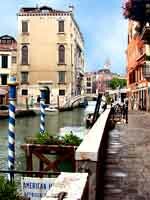 Afterwards we walked in the rain back to the hotel, via Piazza San Marco and the Accademia. Al's brolly jammed and had to be dumped, leaving us with just one. The rain let up just enough for us to get to the opera tent before a new downpour. The doors finally opened and we were shown to our seats in the center of the first row. Great! Better than any seats we've had in any other opera house! But wait. A peek into the orchestra pit revealed that the conductor would be standing on a podium that would raise him directly into our line of sight. Sure enough, when Maestro Mauricio Arena took his place on the podium, he loomed above the orchestra and blocked our view of parts of the stage. The poor lady to our right, who was directly behind Arena, had much more of her view obscured. We, at least, were just enough off-center to be able to see most of the staging. The performance was not exceptional but enjoyable nonetheless. 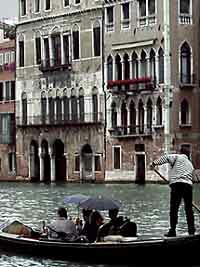 The rain had stopped as we caught a late vaporetto back to the hotel. It was after 11:00 but the canal was dark. 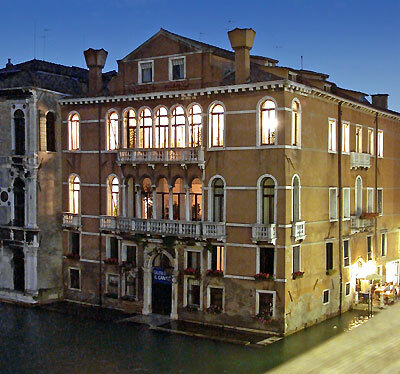 Or rather, all the buildings on the Grand Canal were dark. No lights. 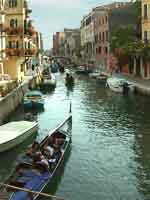 Here is a beautiful canal, with people gliding by on boats at night, and the buildings were dark. 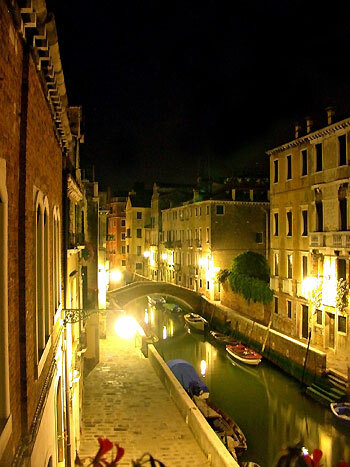 What a shame that Venetians don't realize how beautiful their city would look at night if the buildings were illuminated. The cost of lighting would pay for itself. We returned to the Dorsoduro about midnight. Although hungry, we could find nothing open nearby. Our neighborhood around the Rio di San Vio shuts down by 10:00.